DONATE MAY 7 beginning at Midnight! San Angelo Gives is a 24-hour online fundraising event hosted by San Angelo Area Foundation that will unite our community around causes that matter. San Angelo Gives is a great way to give community members the chance to find and support nonprofit organizations whose mission aligns with their passions. 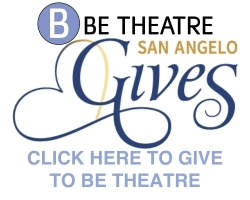 If you are visiting our site, we know you are interested in Be Theatre and our mission to enrich San Angelo community through entertainment and education in theatre arts. Donations will help support our theatre in many areas. providing free theatrical experiences for special needs children in a safe, judge free environment. Tuesday, May 7 , San Angelo Gives (San Angelo Area Foundation) will begin accepting donations to raise unrestricted dollars for area nonprofits. Click. the link above to go to the San Angelo Gives website.